Introducing Vita Mass® Anti Aging Complex Fast Acting Oral Spray An Extraordinary And Revolutionary Homeopathic Formula With DHEA, Pregnenolone, HGH, IGF-1, DNA/RNA, Progesterone And Plus Other Premium Ingredients. If you’re looking to beat the aging process, then this remarkable product is for you! 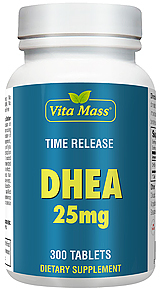 Vita Mass® Anti-Aging Hormone Complex helps to rejuvenate the entire body down to your cells. Feel and look younger. For relief of symptoms associated with negative aging. Reduces wrinkles and fine lines, improves overall body tone, helps eliminate cellulite, reduces grey hair, balances hormones, and restores energy and vigor. I have always been happy with this Product. I've been using this products for a few weeks now and I really see a huge difference in the way my skin feels. This is very effective in restoring the elasticity of my skin and I am really happy how it's working for me. Very nice product. It fights wrinkles and prevents fine lines. Works great in preventing fine lines and keeps my skin smoother and softer. Will buy again for sure!